Audrey and her daughters, Ella and Rose, live out Yellow—spontaneous singing and dancing, soaking up life as the earth does the rays of the sun. Ella and Rose, the true artists, writers, and creative geniuses of Yellow, enjoy playing with their two cats and their rabbit. The three made Yellow together: Ella and Rose created the drawings and collages, and Audrey wrote the poem and designed the pages. When they're not curled up reading together, or off on barefoot adventures in nature, Audrey is passionately involved at The Writer's Garret as instructor and Program Specialist. For her daughters, with all their innocence and curiosity about the world, she hopes to make their world a little brighter. 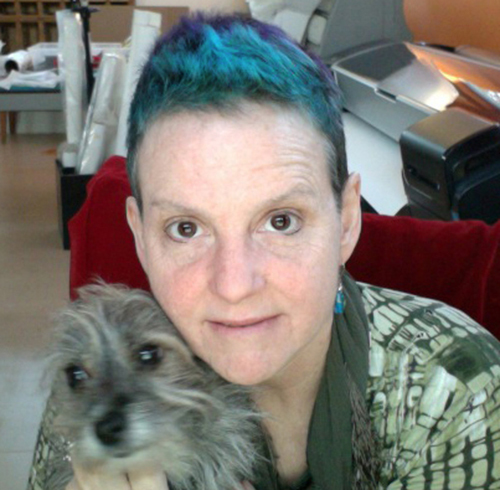 Jolee Davis is the Creator/former Editor of Death List Five, arts and literary magazine, having published the works of Karen X, Robert Trammel, and Harris Schiff. Publication credits include: The Beatest State in the Union (edited by Christopher Carmona and Chuck Taylor) and most recently The Blue Max Review. Featured reader at Laughing Goat, Boulder and many others. Her work is on exhibit as part of Shinpei Takeda's installation, "Inscription" @ The New American Museum, San Diego. She resides in Dallas and at https://desperatelyseekingsusansontag.wordpress.com. A. Kendra Greene is the Writer in Residence at the Dallas Museum of Art's Center for Creative Connections, where her projects give voice to the community through the composition and performance of visitor response text. She is also the author of The Stone Collector and Anatomy of a Museum, essays about Icelandic museums published in a chapbook series from Anomalous Press. Her letterpress work includes broadsides and artist's books, and she's been known to provide the voice for anime Amazons and a bespectacled phonics-teaching dragon..
Fatima-Ayan Malika Hirsi writes in violet ink. She gives poetry to the community as an instructor and Outreach Director for The Writer's Garret. In January 2016, she founded Dark Moon Poetry & Arts to spotlight the creative feminine energies of North Texas. 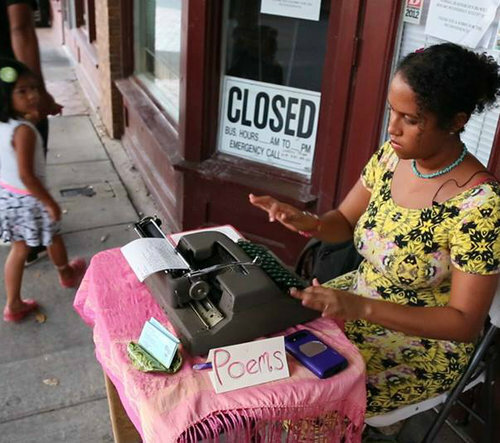 She can often be found on sidewalks using her typewriter to birth poems for strangers. She has been published in Entropy, Anthropology Now!, Bearing the Mask, and elsewhere. Her work has been featured by KERA, The Dallas Morning News, the Dallas Observer, Writer's Digest, and others. She loves cats, and includes this fact in her bios without shame or guilt.. The creator of White Rock Zine Machine, Lisa Huffaker is a poet, musician, visual artist, and teacher. Lisa’s poems have been published in Southwest Review, Poet Lore, Measure, Southern Poetry Review, Mezzo Cammin, The Texas Observer, Able Muse, One, Southern Humanities Review, and elsewhere. She won the Morton Marr Poetry Prize, and has been nominated for the Pushcart Prize. A classical singer by training, Lisa holds a Master of Music degree in Vocal Performance from the New England Conservatory, and sings with The Dallas Opera. 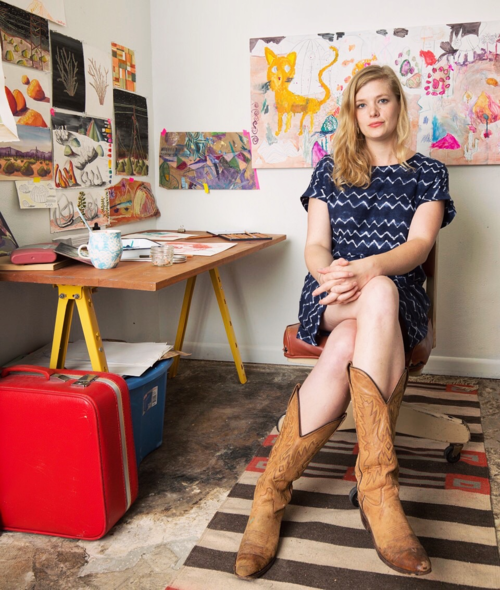 She teaches creative writing through The Writer’s Garret, presenting monthly creative writing adventures at the Nasher Sculpture Center, as well as zine workshops (her zine camp at Oil and Cotton won a “Best of Dallas” award!) She's not new to facilitating collaborative artistic endeavors: see www.bigblueumbrella.blogspot.com. Rebecca Landsdowne-Collins is a mixed media mosaic artist. She counts herself among the fortunate in that she has been able to create a life that she loves. A commercial artist by day, she runs the highly successful pet portraiture studio Artpaw.com. By night, indulging her true love, she cuts and glues glass tessera, creating mixed media mosaics that explore a wide variety of themes and subjects. Rebecca’s journey into the world of fine art mosaic has allowed her to combine her digital skills with a profound love of collage, paint, and drawing. She has developed a unique style of working making full use of this versatility. Her ability to move back and forth between traditional media and current digital technology gives her mosaic work a contemporary edge while maintaining the textural richness inherent in mosaic. Rebecca received her B.F.A. from The University of North Texas. She is married to a poet and together they play and create in their little east Dallas bungalow beset by three wild terriers. Joe Milazzo is a writer, editor, educator, and designer. He is the author of the novel Crepuscule W/ Nellie (Jaded Ibis Press) and The Habiliments (Apostrophe Books), a volume of poetry. His writings have appeared in Black Clock, Black Warrior Review, BOMB, The Collagist, Drunken Boat, Tammy, and elsewhere. 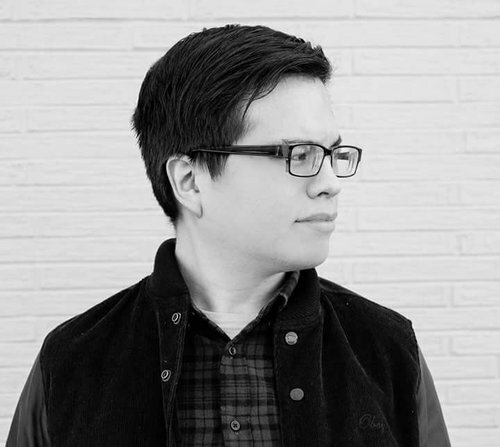 He co-edits the online interdisciplinary arts journal [out of nothing], is a Contributing Editor at Entropy, curates the Other People's Poetry reading series, and is also the proprietor of Imipolex Press. Joe lives and works in Dallas, TX, and his virtual location is www.joe-milazzo.com. Brad Ford Smith became the archivist for the Nomadic Fungi Institute in 2014. The Nomadic Fungi Institute is dedicated to the documentation of the mutated fungus classified as Nomadic Fungi, a parasitic fungus that feeds upon automobiles. Visit the NFI at www.worldofnomadicfungi.com. Sebastian Hasani Paramo holds an MFA from Sarah Lawrence College. His work has appeared, or is forthcoming, in Pleiades, Front Porch Journal, Prelude, Huizache, upstreet, North American Review, and other places. He is the editor-in-chief of the journal The Boiler and lives in Denton, Texas, where he is a teaching fellow in the doctoral program at the University of North Texas. He co-curates The Pegasus Reading Series in Dallas. A native Texan and a lover of community, Emily Riggert has found herself at home across the state in Dallas, San Antonio, and Austin. Her current home-base is in Dallas’ Oak Cliff neighborhood. She began her career as a teaching artist in 2011. In the studio, Emily makes art about growth and decay in nature. In addition, Emily creates large-scale public artworks, designed to activate forgotten spaces and engage local community through direct participation. She is interested in the confluence of creative process between maker and viewer, educator and student, and sees her work as an educator to be an extension of her own artwork. Emily is currently exploring these topics in her role as co-founder of Sunset Art Studios. Visit her at emilyriggert.com. Carlos Salas is the co-host of the Poets on X+ Reading Series at Lucky Dog Books. He can be heard reading at open mics, galleries, bars, porches, and can be found right here on Earth, 75208 specific. He lives with love, beautiful wife-poet Opalina in Oak Cliff, TX with their daughter Paloma, two cats Jack and Benny. Opalina Salas is a poet, a formerOak Cliff bookstore owner, an editor of femme lit zine, Let It Bleed, and creator and host of Poets on X+ reading series held in her beloved home of Oak Cliff TX. She has been a curator and hostess for many WordSpace events in Dallas and feels most at home on stage at any local open mic in her area. She is a regular contributor to The Mad Swirl, and was a featured performer at The Texas Beat Poetry Festival 2012, Forest Fest in Lamesa TX in 2011, and a participant in the first annual New Orleans Poetry Fest of 2016. She has been writing and performing in and around the DFW area for 20 years with her comrade, partner and fellow poet, Carlos Salas. Her only desire is to continue her pursuit of the open mic state, country and worldwide and to finally construct that one perfect poem. Until then, she continues.